Main window of the global/base profile. 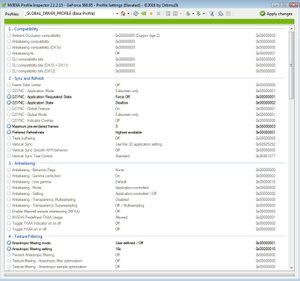 Nvidia Profile Inspector (NPI) is a third-party tool created for pulling up and editing application profiles within the Nvidia display drivers. It works much like the Manage 3D settings page in the Nvidia Control Panel, but goes more in-depth and exposes settings and offers functionality not available through the normal control panel. The tool was spun off of the original Nvidia Inspector, which featured an overclocking utility and required you to create a shortcut to launch the profile editor. 2.2 Why force Anisotropic Filtering (AF)? Save and extract it to an appropriate permanent location. Run nvidiaProfileInspector.exe to start the application. It may be worth making a shortcut and pinning it to your start menu or desktop. White cog - Global default / Unchanged. Grey cog - Global override through the base _GLOBAL_DRIVER_PROFILE profile. Blue cog - Profile-specific user-defined override. Green cog - Profile-specific Nvidia predefined override. Download and run the latest version of the Profile Inspector, see Installation. Click on the Create new profile icon (the sun). Give the profile a relevant name. The name of the game is often used. Click on the Add application to current profile icon (a small window with an icon of binoculars with a "+" above it). Navigate to <path-to-game> and select the game executable and click Open. If you get a message that Filename.exe already belongs to a profile, verify that the application does not exist in the Profiles list again, then re-select the executable again with the file format in the selection dialog set to Application Absolute Path (*.exe) instead of the default Application EXE Name (*.exe). Finally click on Apply changes to save the changes. Why force Anisotropic Filtering (AF)? Example of a global override. This is an example of why you should set texture filtering globally and forget it, as some developer's own solutions are not as high quality as they could be. If any game has a conflict with driver forced texture filtering, Nvidia usually sets a special flag on a profile for texture filtering that disables driver overrides for that game, such as with Far Cry 3 and Doom (2016). A quicker way of doing this is to use Nvidia Control Panel and set Anisotropic filtering to 16x and Texture filtering - Quality to High quality under Manage 3D settings > Global Settings. Select the _GLOBAL_DRIVER_PROFILE (Base Profile) profile. Configure the relevant settings under Texture Filtering as shown here. Using Nvidia Profile Inspector, is becomes possible to disable Ansel on a per-game basis if desired. The display drivers loads Ansel related DLL files into all running applications they interface with by default, even if the application does not support or can make use of Ansel. This can cause issues for third-party tools or applications. Scroll down to the Other section and configure Enable Ansel to 0x00000000 ANSEL_ENABLE_OFF. Keep changes to the base _GLOBAL_DRIVER_PROFILE profile limited, as overrides there are applied to all games and applications. Compatibility parameters that allows ambient occlusion, anti-aliasing, and SLI to be used for games, if given an appropriate value. Ambient Occlusion compatibility Allows HBAO+ to work with any given game. Antialiasing compatibility Allows various forms of anti-aliasing to work with any given DirectX 9 game. Antialiasing compatibility (DX1x) Allows various forms of anti-aliasing to work with DirectX 10/11/12 games. Often restricted to MSAA and generally sees little use due to its limited capability. Antialiasing Fix Avoid black edges in some games while using MSAA. Related to Team Fortress 2 and a few other games as well, where it is enabled by default. SLI compatibility bits Allows SLI to work in any given DirectX 9 game. SLI compatibility bits (DX10+DX11) Allows SLI to work in any given DirectX 10/11 game. SLI compatibility bits (DX12) Allows SLI to work in any given DirectX 12 game. See Frame rate (FPS) for relevant information. The built-in frame rate limiter of the Nvidia display drivers introduces 2+ frames of delay, while RTSS (and possibly other alternatives) only introduces 1 frame of delay. AnandTech - Triple Buffering: Why We Love It - Recommended reading about triple buffering/Fast Sync. Flip Indicator Enables an on-screen display of frames presented using flip model. Frame Rate Limiter Enables the built-in frame rate limiter of the display drivers at the specified FPS. Frame Rate Limiter Mode Controls what mode of the frame rate limiter will be used. GSYNC - Application Mode Controls whether the G-Sync feature will be active in fullscreen only, or in windowed mode as well. GSYNC - Application Requested State If you know what this setting does, please add a description here. GSYNC - Application State Selects the technique used to control the refresh policy of an attached monitor. Allow enables the use of G-Sync, and syncronizes monitor refresh rate to GPUs render target. Force off and Disallow disables the use of G-Sync. Fixed Refresh Rate is the traditional fixed refresh rate monitor technology. Ultra Low Motion Blur (ULMB) uses back light pulsing at a fixed refresh rate to minimize blur. It is highly recommended to change this using the Nvidia Control Panel > Manage 3D Settings > Monitor Technology instead to properly configured this and related parameters. GSYNC - Global Feature Toggles the global G-Sync functionality. It is recommended to change this using the Nvidia Control Panel > Set up G-SYNC instead to properly configured this and related parameters. GSYNC - Global Mode Controls whether the G-Sync feature will be active globally in fullscreen only, or in windowed mode as well. GSYNC - Indicator Overlay Enables a semi-transparent on-screen status indicator of when G-Sync is being used. If G-Sync is not being used, the indicator is not shown at all. Maximum pre-rendered frames Controls how many frames the CPU can prepare ahead of the frame currently being drawn by the GPU. Increasing this can result in smoother gameplay at lower frame rates, at the cost of additional input delay. This setting does not apply to SLI configurations. Default is Use the 3D application setting, and it is recommended not to go above 3. Values of 1 and 2 will help reduce input latency in exchange for greater CPU usage. When Vsync is set to 1/2 Refresh Rate, a value of 1 is essentially required due to the introduced input latency. Preferred Refresh Rate Controls the refresh rate override of the display drivers for games running in exclusive fullscreen mode. This also dictates the upper limit of the G-Sync range, as G-Sync will go inactive and the screen will start to tear at frame rates above the configured refresh rate, or V-Sync will kick in and sync the frame rate to the refresh rate if enabled. Highest available - Overrides the refresh rate of the exclusive fullscreen game to whatever is the highest available on the monitor. This setting is automatically used when G-Sync is enabled. Note that this override might not work for all games, in which case an alternative such as Special K might be needed. Use the 3D application setting / Application-controlled - Uses the refresh rate as requested by the application. If using G-Sync, frame rates above the requested refresh rate will result in screen tearing as G-Sync will go inactive, or V-Sync synchronizing the frame rate to the refresh rate if enabled. This setting is only expose in Nvidia Control Panel for G-Sync monitors supporting refresh rates above 60 Hz. Triple buffering Toggles triple buffering in OpenGL games. Enabling this improves performance when vertical sync is also turned on. Vertical Sync Controls vertical sync, or enables Fast Sync. Fast-Sync is essentially triple buffering for DirectX games, and is only applicable to frame rates above the refresh rate when regular V-Sync is disabled. Vertical Sync Smooth AFR behavior Toggles V-Sync smoothing behavior when V-Sync is enabled and SLI is active. Smooth Vsync is a new technology that can reduce stutter when Vsync is enabled and SLI is active. When SLI is active and natural frame rates of games are below the refresh rate of your monitor, traditional vsync forces frame rates to quickly oscillate between the refresh rate and half the refresh rate (for example, between 60Hz and 30Hz). This variation is often perceived as stutter. Smooth Vsync improves this by locking into the sustainable frame rate of your game and only increasing the frame rate if the game performance moves sustainably above the refresh rate of your monitor. This does lower the average framerate of your game, but the experience in many cases is far better. Vertical Sync Tear Control Toggles Adaptive V-Sync when vertical sync is enabled. Not available when G-Sync is enabled. See Anti-aliasing (AA) for relevant information. Antialiasing - Behavior Flags These mostly exist as a method of governing usage of AA from Nvidia Control Panel, though they also affect Inspector as well. Make sure you are clearing out any flags in this field for a game profile when forcing AA as it will interfere and cause it not to work if you aren't careful. Antialiasing - Gamma Correction Gamma correction for MSAA. Introduced with Half-Life 2 in 2004. Defaults to ON starting with Fermi GPUs. Should not be set to OFF on modern hardware. Antialiasing - Line gamma Applies gamma correction for singular lines (like wires) as compared to edges. Application Controlled - The application itself controls anti-aliasing settings and techniques. The display driver does not override or enhance the anti-aliasing setting the application configures. Override Application Setting - The display drivers overrides the anti-aliasing setting of the application. This allows one to force anti-aliasing from the display driver. General rule of thumb is to disable any in-game anti-aliasing/MSAA when using this to avoid conflict. There are exceptions though; generally noted in the Anti-Aliasing Compatibility Flags document. Enhance Application Setting - Enhances the anti-aliasing of a game (e.g. enhance in-game MSAA with TrSSAA), which can provide higher quality and greater reliability for applications with built-in support for anti-aliasing. You must set any anti-aliasing level within the application for this mode to work with the Antialiasing - Setting override. Use Override Application Setting if the application does not have built-in anti-aliasing settings or if the application does not support anti-aliasing when HDR rendering is enabled. When dealing with modern games, you will most likely want to use this option and not any of the other two. Enhance Application Setting is entirely dependent on the implementation of MSAA in the application itself. This is can be hit or miss in modern DirectX 10+ games; more often than not either it does not work at all, breaks something, or looks very bad. See Enhance application setting for more information. This is where the specific method of forced/enhanced MSAA is set. This enables and disables the use of transparency multisampling. This sets whether Supersampling and Sparse Grid Supersampling is used. This enables Nvidia's Multi Frame Anti Aliasing mode. This only works in DXGI (DX10+) and requires either the game to have MSAA enabled in the game or MSAA to be forced. What it does is change the sub sample grid pattern every frame and then is reconstructed in motion with a "Temporal Synthesis Filter" as Nvidia calls it. There are some caveats to using this though. It is not compatible with SGSSAA as far as shown in limited testing. Depending on the game, MFAA causes visible flickering on geometric edges and other temporal artifacts. Part of this is nullified with downsampling. It has a minimum framerate requirement of about 40FPS. Otherwise MFAA will degrade the image. Visible sawtooth patterns with screenshots and videos captured locally. Nvidia Predefined FXAA Usage Controls whether Nvidia's FXAA implementation is allowed to be enabled for an application through Nvidia Control Panel (primarily) or Nvidia Profile Inspector. Toggle FXAA indicator on or off This will display a small green icon in the left upper corner if enabled showing whether FXAA is enabled or not. Toggle FXAA on or off FXAA is a fast shader-based post-processing technique that can be applied to any application, including those which do not support other forms of hardware-based antialiasing. FXAA can also be used in conjunction with other antialiasing settings to improve overall image quality. Turn FXAA On to improve image quality with a lesser performance impact than other antialiasing settings. Turn FXAA Off if you notice artifacts or dithering around the edges of objects, particularly around text. Enabling this setting globally may affect all programs rendered on the GPU, including video players and the Windows desktop. When overriding the in-game MSAA fails, you can instead replace (enhance) the in-game MSAA with the NVIDIA MSAA technique of your choice. These usually require anti-aliasing compatibility flags to work properly in DirectX 9 applications; see Compatibility for details and resources. The level of supersampling must match a corresponding level of MSAA. For example, if 4x MSAA is used, then 4x Sparse Grid Supersampling must be used. In OpenGL Supersampling is equivalent to Sparse Grid Supersampling. Ergo, 4xMSAA+4xTrSSAA will give you 4xFSSGSSAA in OpenGL games that work. See Anisotropic filtering (AF) for relevant information. Anisotropic filtering mode Toggles the built-in anisotropic filtering override of the display drivers. 16x results in the best quality. It is possible to add a global override that forces anisotropic filtering on all games. This can solve texture filtering issues that would otherwise exist in games that have mediocre texture filtering. See Why force Anisotropic Filtering (AF)? for details. Anisotropic filtering setting Controls the level of texture filtering the driver override applies, if Anisotropic filtering mode is set to User-defined / Off. Modern GPUs can perform 4x anisotropic filtering at no performance penalty. Prevent anisotropic filtering Similar to AA Behavior Flags, if this is set to On it will ignore user-defined driver overrides. Some games default to this, such as Quake 4, RAGE, Doom (2016), Far Cry 3, and Far Cry 3: Blood Dragon. Texture filtering - Anisotropic filter optimization Anisotropic filter optimization improves performance by limiting trilinear filtering to the primary texture stage where the general appearance and color of objects is determined. Bilinear filtering is used for all other stages, such as those used for lighting, shadows, and other effects. This setting only affects DirectX programs. Texture Filtering - Anisotropic sample optimization Anisotropic sample optimization limits the number of anisotropic samples used based on texel size. This setting only affects DirectX programs. Texture Filtering - Driver Controlled LOD Bias When using SGSSAA with this enabled will allow the driver to compute it's own negative LOD bias for textures to help improve sharpness (at cost of potential for more aliasing) for those who prefer it. It's generally less than the fixed amounts that are recommended. Manual LOD bias will be ignored when this is enabled. The level of detail bias setting for textures in DirectX applications. This normally only works under 2 circumstances, both of which requires Driver Controlled LoD Bias set to Off. When Antialiasing - Mode is set to Override Application Setting or Enhance Application Setting, and an appropriate Antialiasing - Setting is selected. If you leave the Antialiasing - Mode setting to Application Controlled or Enhance Application Setting but you set the anti-aliasing and transparency setting to SGSSAA (e.g. 4xMSAA and 4xSGSSAA; TrSSAA in OpenGL) then you can freely set the LOD bias and the changes will work without forcing anti-aliasing. This has the side effect that in some games if the game has MSAA, it will act as if you were "enhancing" the game setting even if using Application Controlled. Do not use a negative LOD bias when using OGSSAA and HSAA as they have their own LOD bias. Texture Filtering - LOD Bias (OGL) Identical to Texture Filtering - LOD Bias (DX) but applies to OpenGL applications instead. Texture Filtering - Negative LOD bias Some applications use negative LOD bias to sharpen texture filtering. This sharpens the stationary image but introduces aliasing ("shimmering") when the scene is in motion. This setting controls whether negative LOD bias are clamped (not allowed) or allowed. Has no effect on Fermi GPU's and beyond; clamps by default on those GPUs. Texture Filtering - Quality This setting allows you to decide if you would prefer performance, quality, or a balance between the two. If you change this using the Nvidia Control Panel, the control panel will make all of the appropriate texture filtering adjustments based on the selected preference. Should be set to or left at High Quality if not using a GeForce 8 series GPU or earlier. Texture Filtering - Trilinear Optimization Trilinear optimization improves texture filtering performance by allowing bilinear filtering on textures in parts of the scene where trilinear filtering is not necessary. This setting only affects DirectX applications. Disabled if Texture Filtering - Quality is set to High Quality. Quality and High Quality are nearly identical, while Performance noticeably lowers the resolution and precision of the effect in many games with less-accurate and stronger shading. Certain games need Performance to support forced ambient occlusion, such as Oddworld: New 'n' Tasty! Ambient Occlusion usage Set this to Enabled when using forced ambient occlusion. CUDA - Force P2 State If set to OFF it forces GPU into P0 State for compute. Extension limit Extension limit indicates whether the driver extension string has been trimmed for compatibility with particular applications. Some older applications cannot process long extension strings and will crash if extensions are unlimited. If you are using a newer OpenGL application, you should turn this option off. Multi-display/mixed-GPU acceleration This controls GPU-based acceleration in OpenGL applications and will have no effect on performance on DirectX platforms. OpenGL - Version Override If you know what this setting does, please add a description here. Optimize for Compute Performance If you know what this setting does, please add a description here. Power management mode This allows you to set a preference for the performance level of the graphics card when running 3D applications. It is recommended to configure this on a per-game basis using game-specific profiles, to prevent unnecessary power draw while not gaming. Automatically determines whether to use a lower clock speed for games and apps. Works well when not playing games. Older Nvidia GPU Boost GPUs tend to incorrectly use a lower clock speed. Setting power management mode from Adaptive to Maximum Performance can improve performance in certain applications when the GPU is throttling the clock speeds incorrectly. Same as Adaptive, but will not re-render frames when the GPU workload is idle; instead it will just display the previous frame. The default power management mode on modern graphics cards. Prevents the GPU from switching to a lower clock speed for games and apps. Works well when playing games. Wasteful when not using GPU-intensive applications or games. Shader cache Enables or disables the shader cache, which saves compiled shaders to your hard drive to improve game performance. Show PhysX Visual Indicator Enables a on-screen status indicator of when PhysX is being used. If PhysX is not being used, the indicator is not shown at all. Threaded optimization Allows applications to take advantage of multiple CPUs. Most newer applications should benefit from the Auto or On options. This setting should be turned off for most older applications. Antialiasing - SLI AA This determines whether a Nvidia SLI setup splits the MSAA workload between the available GPUs. Disable SLI (Explicitly set through NVAPI) If you know what this setting does, please add a description here. Number of GPUs to use on SLI rendering mode If you know what this setting does, please add a description here. NVIDIA predefined number of GPUs to use on SLI rendering mode If you know what this setting does, please add a description here. NVIDIA predefined number of GPUs to use on SLI rendering mode on DX10 If you know what this setting does, please add a description here. NVIDIA predefined SLI mode If you know what this setting does, please add a description here. NVIDIA predefined SLI mode on DX10 If you know what this setting does, please add a description here. SLI indicator Enables a semi-transparent on-screen status indicator of when SLI is being used and how the workload is split between the cards. SLI rendering mode If you know what this setting does, please add a description here. Lists stereoscopic 3D settings related to Nvidia 3D Vision. Force Stereo shuttering If you know what this setting does, please add a description here. LaserXAdjust If you know what this setting does, please add a description here. LaserYAdjust If you know what this setting does, please add a description here. Stereo - Display mode This setting allows you to choose the appropriate display mode for shutter glasses, stereo displays, and other hardware. Refer to the hardware documentation to determine which mode to use. Stereo - Dongle Support If you know what this setting does, please add a description here. Stereo - Enable Enables stereo in OpenGL applications. Stereo - Swap eyes Select this option to exchange the left and right images. Stereo - Swap mode If you know what this setting does, please add a description here. StereoConvergence If you know what this setting does, please add a description here. StereoCutoff If you know what this setting does, please add a description here. StereoCutoffDepthFar If you know what this setting does, please add a description here. StereoCutoffDepthNear If you know what this setting does, please add a description here. StereoFlagsDX10 If you know what this setting does, please add a description here. StereoMemoEnabled If you know what this setting does, please add a description here. StereoProfile If you know what this setting does, please add a description here. StereoTextureEnable If you know what this setting does, please add a description here. StereoUseMatrix If you know what this setting does, please add a description here. Lists settings which do not match another category. Ansel flags for enabled applications If you know what this setting does, please add a description here. Application Profile Notification Popup Timeout If you know what this setting does, please add a description here. Battery Boost If you know what this setting does, please add a description here. Buffer-flipping mode Determines how the video buffer is copied to the screen. This setting only affects OpenGL programs. Auto-select allows the driver to determine the best method based on the hardware configuration. Use block transfer produces smoother drawings for some applications, though it may be slower at higher frame rates and introduce tearing. Deep color for 3D applications If you know what this setting does, please add a description here. This setting only affects OpenGL programs. Display the VRR Overlay Indicator If you know what this setting does, please add a description here. Do not display this profile in the Control Panel Hides the profile from being listed in Nvidia Control Panel > Manage 3D Settings > Program Settings. Enable Ansel Toggles Ansel (NvCamera) for the application. This is enabled by default and results in the display drivers injecting the DLL files for Ansel in all applications. Enable application for Optimus On an Optimus laptop, controls whether the selected application runs on the dedicated Nvidia GPU or the integrated GPU. Enable NV_gpu_multicast extension If you know what this setting does, please add a description here. This setting only affects OpenGL programs. Enable overlay Allows the use of OpenGL overlay planes in programs. Typically used if a program fails to render OpenGL planes. Event Log Severity Threshold If you know what this setting does, please add a description here. This setting only affects OpenGL programs. Event Log Tmon Severity Threshold If you know what this setting does, please add a description here. This setting only affects OpenGL programs. Export Performance Counters If you know what this setting does, please add a description here. Export Performance Counters for DX9 only If you know what this setting does, please add a description here. Exported Overlay pixel types Determines whether the driver supports RGB or color indexed OpenGL overlay plane formats. Typically used if a program fails to set the proper OpenGL overlay plane format. Frame Rate Monitor If you know what this setting does, please add a description here. Frame Rate Monitor Control If you know what this setting does, please add a description here. High level control of the rendering quality on OpenGL If you know what this setting does, please add a description here. ICafe Settings If you know what this setting does, please add a description here. List of Universal GPU ids If you know what this setting does, please add a description here. Maximum AA samples allowed for a given application If you know what this setting does, please add a description here. Maximum frames allowed If you know what this setting does, please add a description here. Maximum resolution alllowed for a given application If you know what this setting does, please add a description here. Memory Allocation Policy This defines how workstation feature resource allocation is performed. As Needed (default) - Resources for workstation features are allocated as needed resulting in the minimum amount of resource consumption. Feature activation or deactivation often causes mode-sets. Moderate pre-allocation - Resources for the first workstation feature activated are statically allocated at system boot and persist thereafter. This will use more GPU and system memory, but will prevent mode-sets when activating or deactivating a single feature. Invocation of additional workstation features will still cause mode-sets. Aggressive pre-allocation - Resources for all workstation features are statically allocated at system boot and persist thereafter. This will use the most GPU and system memory, but will prevent mode-sets when activating or deactivating all workstation features. NVIDIA Predefined Ansel Usage If you know what this setting does, please add a description here. NVIDIA Quality upscaling If you know what this setting does, please add a description here. OpenGL default swap interval If you know what this setting does, please add a description here. OpenGL default swap interval fraction If you know what this setting does, please add a description here. OpenGL default swap interval sign If you know what this setting does, please add a description here. Optimus flags for enabled applications If you know what this setting does, please add a description here. PowerThrottle If you know what this setting does, please add a description here. Preferred OpenGL GPU Select the GPU to be used by OpenGL applications. Quiet Mode If you know what this setting does, please add a description here. Quiet Mode Application FPS If you know what this setting does, please add a description here. Shim Rendering Mode Options per application for Optimus If you know what this setting does, please add a description here. SILK Smoothness Silk reduces stutters in games caused by variable CPU or GPU workloads by smoothing out animation and presentation cadence using animation prediction and post render smoothing buffer. Off – Silk is disabled. Low – Moderate smoothing is enabled and most microstutter is eliminated. Medium – Many stutters and hitches are removed in typical games. High – More smoothing is applied and may result in observable input lag. Ultra – Maximum smoothing is applied and most stutters and hitches in games are eliminated. Lag may be unacceptable in some games. Selecting High or Ultra settings for silk can increase noticeable lag when playing, and may not be appropriate for first person shooters or competitive gaming. Steam Application ID If you know what this setting does, please add a description here. Unified back/depth buffer If you know what this setting does, please add a description here. This setting only affects OpenGL programs. VAB Default Data If you know what this setting does, please add a description here. Variable refresh Rate If you know what this setting does, please add a description here. Virtual Reality pre-rendered frames Limits the number of frames the CPU can prepare before the frames are processed by the GPU. Lower latency is preferable for virtual reality head sets. Vsync - Behavior Flags If you know what this setting does, please add a description here. These are unknown settings or overrides that Nvidia Profile Inspector is not aware of what they determine or controls. 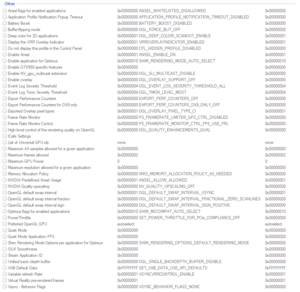 Most of these are game-specific overrides only applicable to a few games, or new flags that were introduced in newer versions of the display drivers. Not all unknown settings can be properly exported and imported at will. If a built-in profile using one of those have been removed, the recommendation is to reinstall the display drivers to ensure they are restored fully. "added FERMI_SETREDUCECOLORTHRESHOLDSENABLE as "Antialiasing fix" to avoid black edges in some games while using MSAA (R320.14+)"
"Needless to say, even if an in-game framerate limiter isn’t available, RTSS only introduces up to 1 frame of delay, which is still preferable to the 2+ frame delay added by Nvidia’s limiter with G-SYNC enabled, and a far superior alternative to the 2-6 frame delay added by uncapped G-SYNC." "The 'maximum pre-rendered frames' function operates within the DirectX API and serves to explicitly define the maximum number of frames the CPU can process ahead of the frame currently being drawn by the graphics subsystem. This is a dynamic, time-dependent queue that reacts to performance: at low frame rates, a higher value can produce more consistent gameplay, whereas a low value is less likely to introduce input latencies incurred by the extended storage time (of higher values) within the cache/memory. Its influence on performance is usually barely measurable, but its primary intent is to control peripheral latency." This is a comment by the modder Kaldaien in his Special K mod for Ys 8, which among other things included an anisotropic filtering override.  The comment is shown while hovering the mouse over the anisotropic filtering override. "Shaders are used in almost every game, adding numerous visual effects that can greatly improve image quality (you can see the dramatic impact of shader technology in Watch Dogs here). Generally, shaders are compiled during loading screens, or during gameplay in seamless world titles, such as Assassin's Creed IV, Batman: Arkham Origins, and the aforementioned Watch Dogs. During loads their compilation increases the time it takes to start playing, and during gameplay increases CPU usage, lowering frame rates. When the shader is no longer required, or the game is closed, it is discarded, forcing its recompilation the next time you play. In today's 337.88 WHQL drivers we've introduced a new NVIDIA Control Panel feature called "Shader Cache", which saves compiled shaders to a cache on your hard drive. Following the compilation and saving of the shader, the shader can simply be recalled from the hard disk the next time it is required, potentially reducing load times and CPU usage to optimize and improve your experience. By default the Shader Cache is enabled for all games, and saves up to 256MB of compiled shaders in %USERPROFILE%\AppData\Local\Temp\NVIDIA Corporation\NV_Cache. This location can be changed by moving your entire Temp folder using Windows Control Panel > System > System Properties > Advanced > Environmental Variables > Temp, or by using a Junction Point to relocate the NV_Cache folder. To change the use state of Shader Cache on a per-game basis simply locate the option in the NVIDIA Control Panel, as shown below." "SLI AA essentially disables normal AFR rendering, and in 2-way mode will use the primary GPU for rendering + forced AA, while the secondary GPU is only used to do AA work. In SLI8x mode for example, each GPU would then do 4xMSAA after which the final result becomes 4xMSAA+4xMSAA=8xMSAA. This can be useful in games without proper SLI support, so at least the second GPU is not just idling. However it unfortunately only works correctly in OpenGL, and there will be no difference in temporal behavior between for example normal forced 4xMSAA+4xSGSSAA and SLI8x+8xSGSSAA in DX9." This page was last edited on 18 April 2019, at 23:25.